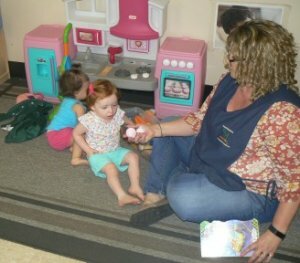 Something Extra Preschool & Childcare takes pride in our infant center being a warm, nurturing, caring place. Your baby’s emotional and physical security come first. We work closely with parents to provide the best possible care for your infant. We supply your child with a good foundation for future growth and development. Your child’s individual needs are the directives in this program. We believe that all children are a special gift and we take this responsibility seriously. We thank you for considering us to be a part of your child’s life. Your child works daily with our professional staff to improve their skills in many areas. Cognitive and communication skills grow each day with our hands on activities. Your child becomes a learner from day one and they challenge our teachers' creativity as well. Each step of Something Extra Preschool's programs helps your child effectively move up. This advancement comes in both knowledge and the children surrounding them. Your child's peers will become a bigger piece of their learning as they move to the Toddler Program. As infants they are explorers of the world around them. As they move up in our classrooms, we begin helping them discover so much more. Something Extra Preschool prides itself on providing the best environment for your child. This means safety, comfort and everything in between. We want parents to know their child is safe and in good hands when they bring their child in. And we also want your child to know that they have the freedom to explore without fear. Our team of professional educators play a huge role in this safe environment. Your child bonds with their teachers at every level, and they become part of our family from day one.